It looks better than the orignal Super NES game, and that's pretty much due to the pre-rendering of characters and objects. But the courses themselves have a nice level of detail and color. Just like the old SNES days, but now with annoying character voices. This edition of Mario Kart blends techniques of Mario Kart 64 and the look and feel of the original, and it works pretty well. Also, it's a lot more challenging than the N64 version. Once you've completed all of the circuits here, you also unlock every course from the Super NES original. It's like getting two games in one. Plus, there's the multiplayer modes. This one will hang around in your GBA for quite some time. It's nice to finally see a handheld Mario Kart title, and one that brings back the challenge as well. It's nice to finally see a Mario Kart game on one of Nintendo's handhelds, and one that recaptures the spirit of the 16-bit era title rather than the 64-bit one. File this game under "about damn time". Ok, it has been on shelves for over a year, but what I mean is that it has been so long to finally see a Mario Kart game on a GameBoy system. Sure, it wouldn't be the same on the older GB systems, but I can't see why Nintendo never decided to cash in on the license. But now that there is finally a handheld system that can handle this type of game, we've seen many knock-offs come out of the woodwork. 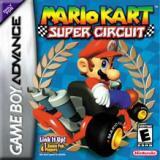 But MKSC feels and plays just as it did back in 1992, and adds new elements that we've seen in the N64 release. It's a must have for just about any GBA owner, and should be considered before going after second-rate substitutes. The design of Mario Kart Super Circuit is painfully simple. Race for top ranking while trying to keep the others behind you with an arsenal of items. There's not much technique, but learning the powerslide moves and timing your jumps is pretty important to learn. But it takes some skill to place first in later CC classes, which certainly ups replay value. Also factor in the multiplayer modes, and this adds up to one game you won't want to give up. The graphics are similar to the SNES version of the game released back in 1992, but it looks a little nicer thanks to some advanced technology. Racers are now pre-rendered sprite models, much like the look of the N64 game. Course detail is more colorful and a little more intricate. Although now the graphics are a little behind more modern GBA racers such as V-Rally 3, Moto Racer Advance or even SpyHunter, I couldn't imagine this game looking any other way. It's the nostalgic value, really. But it would have been cool see some of the scaling used in SpyHunter to convey a sense of elevation. I know it could have been done, but it probably wasn't thought of at the time. The sound is pretty good, but it doesn't compare to the SNES game. Blame it on the GBA sound quality. The music on the newer courses seem a little weak, and the classic course songs sound similar, but the sound technology makes it sound different. Then you have all the little noises the characters make, which is either enjoyable or annoying, depending on the person. Seeing how simple MKSC is, it may be understandable why this review is short. But take this with you: MKSC is a must own GBA title, and if you know someone with another GBA and this game, you have another reason to pick this up. If you loved the SNES game, you'll love the new update. It's tougher than the N64 version and ponies up the courses, which is what I like.